New Alien: Isolation Dev Diary "Creating the Alien"
Collectable Card Games (CCGs) are nerdy and extremely popular. The Adventure Time cartoon series is also nerdy and extremely popular. Pairing the two together is an extremely shrewd move on Cartoon Networks’ part, and releasing it as both a physical card game and mobile game is sure to rake in a ton of cash. Directly based on an episode of the series, Card Wars is part Lane Defence, part RPG, part CCG. Players engage in 1v1 combat, first laying down four environmental cards that are the paths you must defend, then laying down unit cards that are compatible with the various lanes that have been placed. Once both players have done this, the battle begins. 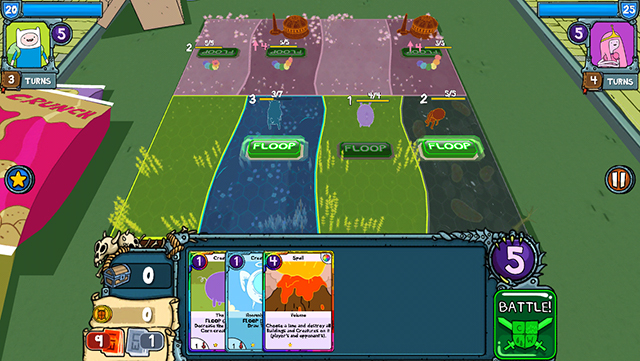 Players take turns to play unit or spell cards, or even activate each unit’s special ability by “Flooping” them, before attacking or defending. During this combat phase, a dial appears with a red portion for misses, a dark green area for successful attacks, and a light green area for those incredibly powerful critical hits. 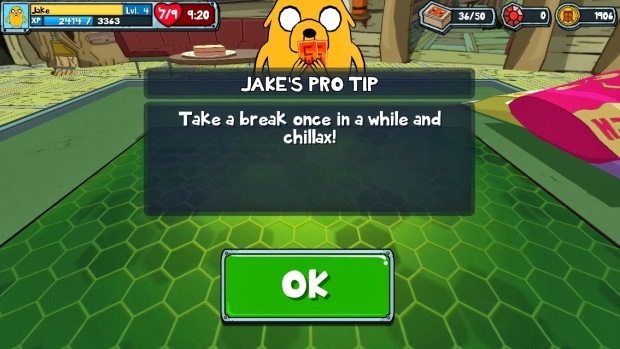 By tapping the screen, players stop the dial on the desired area, namely the critical area. Defending against the AI’s attacks works in a similar fashion, with players able to block (dark green), take damage (red) or counter attack (light green) – but watch out: if a lane is undefended by one of your units, your Hero will take damage. Should your main hero card run out of hit points, you lose. As you can tell, Card Wars’ mechanics are simple, making this a great entry-level CCG for newcomers, although admittedly there isn’t too much depth. As you can imagine, in-app purchases are available for those who want to buy better cards, but the worst kind of IAP is present, where each card battle requires a certain number of “Heart Points” to play. If you run out of heart points, you must wait for them to be replenished or purchase them with real money. For an app you have to pay for in the first place, this is pretty unacceptable. Thankfully, I managed to play for a very long time before I even needed to worry about Heart Points. 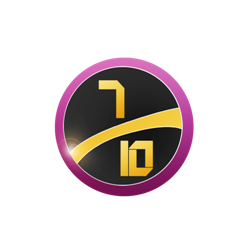 Each battle can be replayed, and doing so will unlock different challenges that unlock better cards and items. These run along the lines of only using certain cards, or not using spells. It’s worth doing these challenges to unlock more powerful cards to make future battles a little easier. Naturally, the main draw here is the license itself, and Card Wars does a fine job of bringing Finn & Jake’s world to life, even if it is only within the confines of their treehouse. Peppered with soundbites from Adventure Time and aesthetics that are as close to the show as polygonal models can be, fans will be more than happy with Card Wars’ faithfulness. A physical version of the game is also available, with the real cards also unlocking better cards in this app as well. VERDICT: Possibly a little repetitive if played for too long, Card Wars is a decent card battler that is best if you are a fan of the Adventure Time series. It’s pretty damn cheeky to feature IAPs in a game that already costs £2.49, but at least these additional purchases are in no way essential to enjoying the game.